The 12-month map (below) indicates widespread water deficits, including exceptional deficits, forecast in Arctic Russia from the White Sea through the Central Siberian Plateau and east to the Sea of Okhotsk. Surpluses are forecast between the Irtysh and Yenisei Rivers in Russia, in the Ural Basin in Kazakhstan, and in central and southern Kazakhstan, and in Kyrgyzstan. In February Tajikistan requested international assistance in dealing with natural disasters resulting from winter precipitation 140 to 170 percent above normal. Snowpack reserves were at 168 percent throughout the country with the Zarafshan River basin at 322 percent, Vakhsh at 148 percent, and Panj at 156 percent. Avalanches isolated dozens of villages in the country's north and east and disrupted travel. As of late March snow water equivalent was above normal for many parts of the country. Officials in Afghanistan are concerned about the potential for catastrophic flooding from the spillway of Tajikistan's Sarez Dam (Usoi Dam), a natural landslide-created dam that formed Sarez Lake on the Murghab River. The lake has a capacity of 16 billion cubic meters of water which, if exceeded, would raise the level of the Amu River threatening hundreds of villages. The dam is considered unstable due to the seismic structure of the area and an earthquake could unleash a flood. 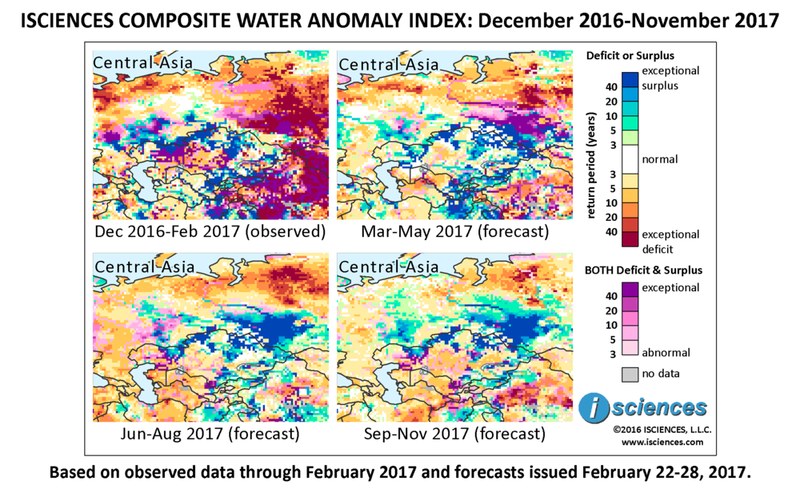 The vibrant and complex patchwork visible in each of the 3-month maps for Central Asia indicates that water anomalies – both drier than normal and wetter than normal – blanket the forecast, with relatively few areas predicted to have normal conditions. Drier than normal conditions will persist in many parts of northern Russia, as seen in the March through May map, from the White Sea through the Central Siberian Plateau, with exceptional deficits reaching from the Upper Taz River past the Yenisei River to the Lower Tunguska River. Both deficits and surpluses – notice the large purple area – are forecast between the Irtysh and Yenisei Rivers and also trace a path along the Ob going west. Farther west, surpluses are forecast between the Volga River in Samara Oblast and the Belaya River in the Republic of Bashkortostan. Surpluses will continue to emerge in the following areas of Kazakhstan: Aktobe Region; northern Kostanay Region; a north/south line down the middle of Kazakhstan through Karagandy Region; along the Ertis River (Irtysh) watershed in the northeast; and Almaty Region. The forecast for Kyrgyzstan indicates surpluses, which are expected to be more intense near Lake Issuk-kyl. Moderate deficits are forecast for eastern Tajikistan and surpluses in the west. Severe deficits are forecast for south-central Uzbekistan and into northern Turkmenistan. From June through August deficits will continue to emerge in northern Russia with greatest extent and intensity in the Lower Yenisei watershed. Exceptional surpluses will emerge between the Irtysh and Yenisei Rivers, shown in dark blue, and will trace a path along the Ob going west. Conditions in Kazakhstan and Kyrgyzstan are expected to be much the same as in the prior three months. Mostly moderate deficits are expected to emerge in Turkmenistan and much of Uzbekistan. The forecast for the final three months indicates some attrition of deficits across northern Russia between the White Sea and the Yamal Peninsula.